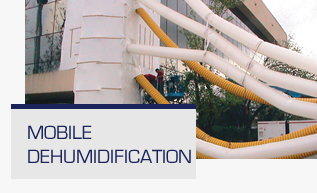 The ARID-Dry mobile large-capacity desiccant dehumidifiers are used in a variety of industries, including water damage and remediation, document drying, industrial surface preparation for coating, mold and fungus prevention, long-term lay-up of industrial equipment, and industrial condensation prevention. 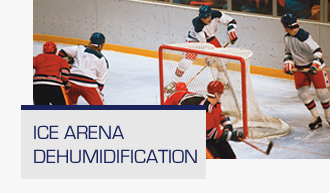 ARID-Ice is the leader in desiccant dehumidifiers. We have provided equipment for over 400 professional and recreational indoor skating surfaces throughout North America from 500 to 45,000 SCFM. 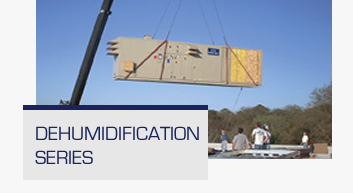 ARID-Dry delivers application-specific solutions for condensation control, fog and mold prevention and for many applications requiring lower humidity levels than are achievable with conventional dehumidification equipment. A simple solution to an old problem. Solid desiccant rotor absorbs moisture from process air. Heat is used to “reactivate” the desiccant. Very dry air can be achieved. 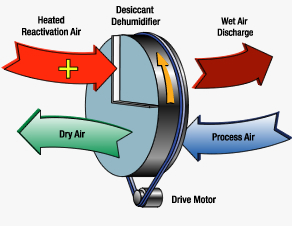 Simple construction: Basic dehumidifier includes only two fans, a heater and the desiccant rotor assembly. Simple maintenance: Simply replace filters regularly and performance is assured. A yearly inspection by our service technicians is recommended to head off unscheduled outages. Better Construction: Double-wall insulated casing suitable for indoor or outdoor mounting. More Sizes: Units range from 600 to 40,000 CFM. More Flexibility: Total system integration is available including heating, cooling, enthalpy recovery, and special filtration. Even custom configurations are available to meet unique project requirements. More Support: Application engineering assistance, start-up and owner training, and preventative maintenance programs.